This past Christmas we saw The Nutcracker at the San Francisco Opera House. We dressed up, wore extra thick jackets, and put on our best shoes. And my 4-year-old daughter loved every bit of it. It was her first time seeing a real ballet production. It was her first time sitting in fancy velvety chairs and needing to be quiet – and still – for nearly two hours. Impossible as it was for this little ball of energy, she did it. She was mezmorized by the whole affair… the costumes, the beautiful music, the way the dancers moved like clouds in the sky. She now wants to dance more than ever. Just two weeks ago, she started her first ballet lesson over at the community center. After that lesson, she was simply over the moon. She hasn’t stopped twirling in front of the mirror. “Today is my ballet class! !” she says, immediately pulling on her dancing clothes (a mix of hand me downs and fresh new white tights) – even though her lesson doesn’t begin for another seven hours. 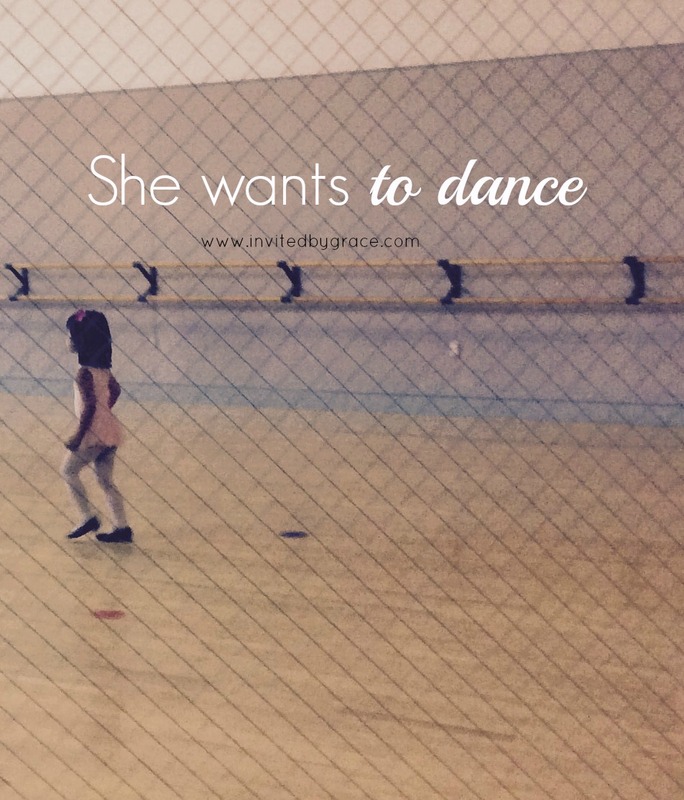 In her class, I watch her as she wiggles, spins, and scampers around with a crew of other little girls of all shapes and sizes and levels of grace. Every little girl, so adorable in her own way, dancing freely. All of them periodically looking out the large window, to catch a glimpse of their momma’s eyes. I do think my daughter is especially sweet out there on the dance floor. But if she inherits my dancing grace, sorry to say, she will never quite be a prodigy. But she wants to dance. Because her young, believing spirit hasn’t heard that she can’t. And today, she feels beautiful and so hopeful in her own skin. I feel over the moon for her! No matter how the music plays, I pray this never changes. Aw thank you. I hold on to that! Thank you for your comment Eric! Your comment brings tears to my eyes. I am so glad that you have been able to dance, even if it at times, your body doesn’t cooperate due to MS. But good for you. I hope you continue to dance, if only to nourish your soul and remind your body that it is still beautiful, functional and purposeful. 🙂 Thank you – yes my daughter is a sweet girl with a big personality and lots of energy (oh I am so tired but blessed). Beautiful post! It is so refreshing to see your kids get so excited about something. It reminds me of the child like excitement i want to have in my life, too. I LOVE the picture if her in her ballet clothes. So precious! 🙂 Beautiful post, Kim! Kim, I delight in her enthusiasm, she is precious. The photo is so real, I love how you capture her in the moment. It reminds me of taking my daughter to ballet lessons and what fun to watch them enjoy themselves with their friends as they twirl about full of energy. Thanks for sharing. So precious. My little girl likes to dance as well. I love watching her, especially during worship at our church. Such innocence and sweet joy! Aw, that is sweet that she loves to dance during worship. It reminds me of Psalm 149, where it says let us praise Him in song and dance. 🙂 And David, he danced before the Lord with all his might! I am really enjoying this time with my daughter… just watching her learn new things and become so excited about everything. I know it won’t last forever, and so I cherish these little moments of this innocent joy. Lovely! I hope she never stops dancing! So sweet, Kim. I love the innocence of children. Dance can be such a picture of beautiful grace. I hope your little girl continues to enjoy dancing freely and joyfully. Thank you, Hannah. I am always in awe of how uncomplicated children make life. If they are happy, they dance. 🙂 When my boys were a little younger, they loved to dance, too! Now, of course, they are a bit more self conscious. I never grew up dancing much, but I can see my daughter has a great excitement for it… I hope she continues to find joy in it! Z takes ballet classes as well and absolutely loves them. I love that she loves to dance. I feel the same way you do. 🙂 Enjoy!